Victoria heard the comments made and cried all the way home. She is now reportedly scared to go out in public, and will refuse to get out if they go somewhere. Her family have been appalled and heart-broken that she has had to endure such treatment, and in protest took to social media to raise awareness. Her picture was posted on Facebook, with a caption underneath describing the events after questioning: “Does this face look scary to you?” As you can imagine, there was a great response with many in complete shock and disgust. 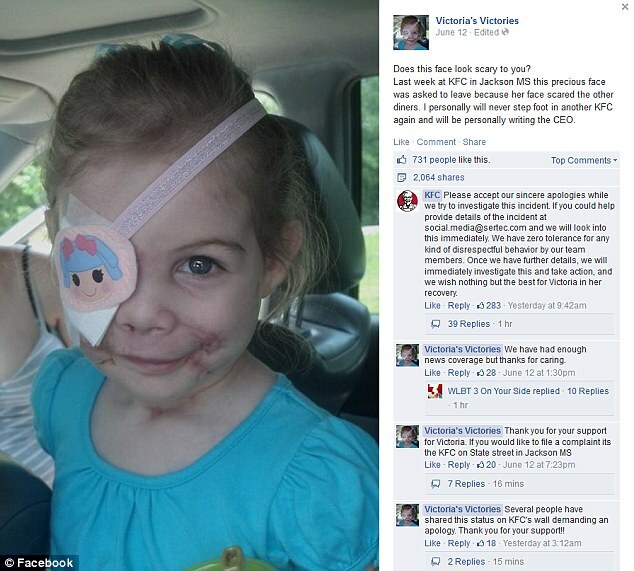 She was mauled in April by three off her grandfather’s Pit Bulls. They ran into his home after ripping through the back door, and then dragged her outside where they mauled her body. She suffered from a shattered top and bottom jaw, broken cheekbones and eye sockets, a broken nose, the loss of her right eye and the ability to move the right side of her face. When her grandfather Donald Mullins, and his girlfriend Rita Tompkins finally saw, they tried to pull the dogs off but were then attacked themselves. They were forced to shoot, and two of the Pit Bulls were killed. The pair have been arrested on charges of child endangerment and their eight surviving dogs were seized. 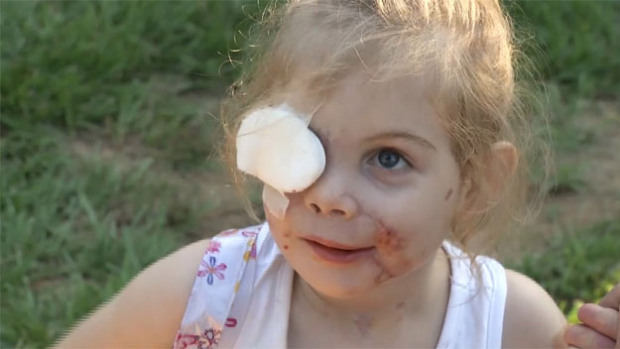 Victoria was hospitalised for one month after the attack, and now continues to have physical therapy and eat through a feeding tube. KFC have stated they are investigating further and have a zero-tolerance for disrespectful behaviour. They have decided to donate $30,000 to help pay for her medical bills, regardless of the outcome of their investigation.